I am looking forward to the premiere of The Last Man on Earth. The half-hour series stars Will Forte, and debuts with two back-to-back shows on Sunday, March 1, 9:00pm ET/PT on FOX. (TV-14 D, L, V). Fox describes the new series as “an end-of-the-world comedy.” If that sounds a bit warped to you, it does to me, too. And it’s also why I’m looking forward to seeing how they will pull this off. The concept, and the name, has a long list of antecedents, beginning (from a movie/TV standpoint at least) with the 1964 science fiction horror film based on the Richard Matheson 1954 novel I Am Legend. The movie was called The Last Man on Earth and starred the legendary genre star Vincent Price. (Not to be confused with 1971’s The Omega Man starring Charlton Heston, or 2007’s I Am Legend starring Will Smith. So, how do you make a comedy series out of a horror movie premise? The answer seems to be by having some fun with it. 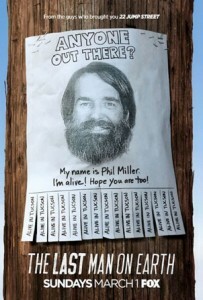 This version of The Last Man on Earth is living in a post-apocalyptic utopia where an average Joe named Phil Miller (Will Forte) discovers what life is like when there are no rules and no one to tell you what to do. “I get to do a lot of wish-fulfillment stuff,” Forte told writers at the Television Critics Association winter press tour. That sounds like fun! And if you are worried that watching Will Forte walk around in his underwear stealing and smashing things might get boring, consider this: maybe he’s not the last person on earth after all. January Jones (of Mad Men and X-Men) and Mary Steenburgen (Melvin and Howard and about 90 other things) are just two of the cast listed on the show’s IMDB site. Yes, some are men. Don’t let that ruin the premise for you, though. There’s no reason they can’t appear in flashbacks. Or maybe he’s not really the last man on earth. Or, like the previous Last Man on Earth iterations, some may appear concurrent with the last real man as “medicated zombies” (as in the The Omega Man). Still, the trailer makes it all look kind of bleak. Maybe that’s why it took so long for this series to find a place in the Fox lineup. The trailer was posted almost a year ago and there are thousands (millions maybe?) of cat videos which have garnered more views. It looks like the series was originally planned for the 2014 fall season, or maybe a mid-season replacement. Alas, just because I am looking forward to it doesn’t mean I don’t think this quirky genre-bending series is doomed. Mark my words, this is a one season show. It will be cancelled. But cancelled schmancelled, think of it as a one season mini-series and a great experience to watch and share with your Snackdish buddies. I know I’ll be there! Watch the first official trailer here. This article was originally published on the Snackdish blog. Snackdish is a social platform for TV and movies.